You put in a couple of Alolan Pokemon which is awesome, have you ever considered putting in some Delta Species pokemon? I think it fits well with the whole experimenting on Pokemon theme. I'm doing a Let's Play of this, really enjoying it so far. The Beldum is guaranteed shiny, right? Hello,I joined because I have this problem patching 1.0.4,the file in NUPS "doesn't match the file" and when I ignore and patch anyway the game freezes after the Nintendo logo on a black screen.What do I do?Clean rom works at 100% speed. I really love this game! It is amazing! I was wondering though there's a way or a tutorial for me to do my own hack somehow? I was a big fan of the delta species pokemon back since they first appeared in the TCG and I have considered it but I've found that a lot of players prefer the game without too many gimmicks. Once XG is a bit more complete I'll probably look into making different variants and I know many people are eager to make their own modifications so hack tools are on the way. I replied in the other thread. I hope it helps! Is there a list of obtainable Pokemon anywhere? I kinda prefer to plan out my teams ahead of time. Everything you could ever want to know is included in the download link. Enjoy! ? Oh, I hadn't realized because I simply downloaded the hacked Rom directly from someone else. Thanks! There is having a problem after patching Pokemon xd. The game is crashing after second turn in Pokemon battle. I am using nups patcher on Android. How to fix this? Asking for roms is piracy, and not allowed on our forums. Please modify your post. I have problem with Pokemon xg. The game auto close after I try to use second turn in Pokemon battle. 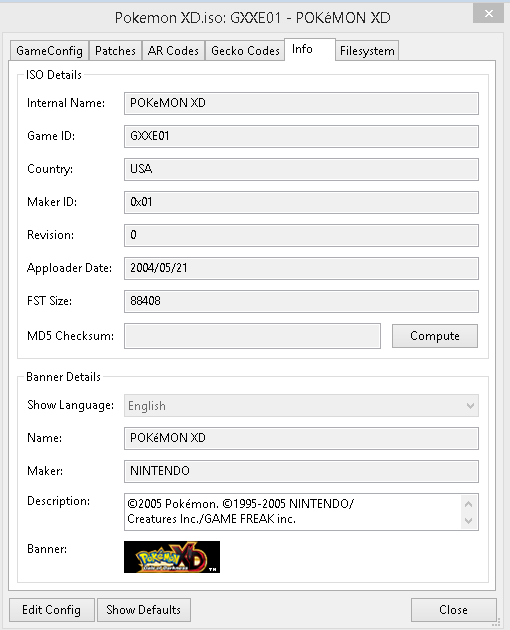 I use unipatcher on Android and patched Pokemon xd usa iso file with Pokemon xg 1.0.7- 2 patch file. Is there any way to fix this problem on Android.? I have a problem, I still have not found the shadow Carvanha the major problem is i never saw it to begin with so the monitor just says "Downloaded from Shadow Output List" and aside from that i have 2 shadows to get from Greevil and the Ho-oh which I imagine is what in the original game would be the Dragonite however I have no clue if the radar will go off for Ho-oh if I don't have all the other shadow pokemon from Greevil and if the radar breaks afterwards then Carvanha will no longer be obtainable at all. I doubt there is an easily solution to this and I would rather not restart the game at all. I believe that was an issue a few versions back. Unfortunately there isn't any solution in-game. One option is to edit the game so that another trainer has shadow carvanha, giving you another chance to catch it. If you're on mac you could easily do this with my XD hack tools. If not I can help whip up a patch for you that updates your version. Apparently, disabling panic handlers in the dolphin options solves that problem. BTW, You can't trade Pokémon to Duking at all without the game crashing. i can't get it to patch properly . every time i patch it it says 'patching done' but when i play it the beldum is a zigzagoon and al the shadow pokemon aren't modified. i have tried multiple ISO's but none of them seem to work. help pls! Hey how do I download it when I already have the Dolphin emulator, do I need the War thing? How do i make this work? Beldum is supposed to be a Zigzagoon now.